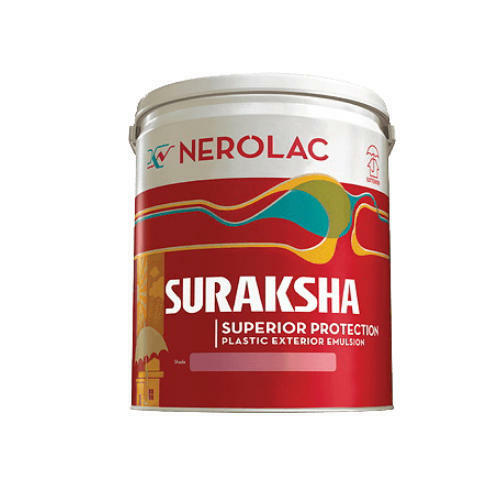 Nerolac Suraksha Plastic Exterior Emulsion is an economical water thinnable coating, specially designed for application on exterior walls in dry or moderately humid climatic conditions. It is much superior to normal cement paint coating in respect of exterior durability, finish, washability and resistance to algae. Ensure the surface is clean, dry and free from all loose or poorly adhering friable material, dirt, grease, wax etc. Rub down the surface using stiff coir brush and high-pressure water jet cleaning. All structural cracks must be opened in V shape Nerolac cement Putty/White Cement Plaster. All leakages must be stopped before actual painting. Freshly Plastered surfaces must be allowed to cure completely. In case of fungus affected area, apply a liberal coat of Nerolac Fungicidal Solution. Allow it to react for minimum 6 to 8 hrs. Dark Shades may require additional coats for hiding. Refer MSDS for Nerolac Suraksha Plastic Exterior Emulsions for safety measures and precautions. Store in well ambient conditions, ventilated locations and away from sources of ignition and Fire. Inhalation/Injection will cause danger. In either move to fresh air and consult medical practitioners in both the cases. Do not apply when the ambient temperature might drop to levels below 10 degrees C within 4 hrs of application. New plaster should be allowed to cure for minimum 12 weeks. Avoid extra thinning for better results. Can be tinted with Nerolac Hi-Power Universal Stainer before thinning. Do not add more than 5% of Nerolac Hi-Power Stainer. Stir the tinted paint well, after tinting and before application. The container must be tightly closed when not in use. Stir well and strain before use. Use safety equipment like rubber or polythene gloves, safety goggles/glasses, and Facemask. Nerolac Suraksha Plastic Exterior Emulsion is recommended for application on an exterior wall of houses and architectural buildings situated in dry or moderately humid climatic conditions. We Nerolac Paints are the manufacturer and producer of Interior paint, Exterior paint, Wood paint, Metal paint and Ancillary paints.